Let’s start with a scenario. Kathy has been feeling stressed at work lately due to a new problem she is facing in her role. There are standard operating procedures (SOP) on how to solve the issue but she also feels that they do not provide solutions to her problem. A — Call her direct manager and ask for solutions. B — Follow all SOPs on how to solve the problem. C — Create an entirely new way of solving the problem. D — Use the SOP where necessary while involving novel solutions, where applicable. IF YOU WERE KATHY, WHAT WOULD YOU DO? “Where necessary” and “where applicable” are some words that are disconcerting for leaders as they figure out how to encourage employees to be more proactive in tackling problems, and balance applying rules and attempting innovation. “Give a man a fish and you feed him for the day; teach a man to fish and you feed him for a lifetime,” goes the saying. In this article, the “fish” is a metaphor for proactivity. How can leaders encourage proactivity in their respective organisations, and catch the “fish”? It is almost impossible to find a one-size-fits-all definition of proactivity but the common conceptualisation revolves around behaviours that are anticipatory, self-initiated and making a difference. Research shows that benefits of being proactive are endless; ranging from personal career success to better job satisfaction and engagement. On organisational levels, it has resulted in higher levels of organisational commitment and increased productivity. This is probably not surprising since being proactive allows employees to exert autonomy and craft their careers to fit their strengths and working styles. In an era of knowledge-based organisations where interdependence for information is found at every level and performance is increasingly determined by less tangible factors (i.e resilience in adversity, experimentation, interpersonal skills), proactivity is as crucial as competence. Nevertheless, research by Belshak and Den Hartog shows that under certain conditions, proactivity may not always be a blessing. A key downside to proactivity could be increased work pressure and mental stress of employees since it requires them to go above and beyond their roles. Moreover, employees who are over-anticipating or moving too quickly without time to reflect may find themselves living the organisational bane of “reacting rather than responding”. This can lead to increased tension in the atmosphere where everyone is trying to outdo each other and firefight before there is actually any fire. In addition, proactivity taken to extremes can lead to employees being singled out as deviant or a complainer for always voicing their opinions. Finally, organisations run the risk of extreme reliance on employees’ proactivity as opposed to institutionalising reliable processes – a common issue in startups. Referring to Kathy’s situation, optimally the answer would be D; but what can we do to foster D as a choice? Let’s look at some lessons from two interesting areas of research: Learning Agility and Execution-as-Learning. One definition of learning agility by the Centre for Creative Leadership (CCL) is having a mindset that pushes leaders to continually develop and adopt new strategies that will equip them for increasingly complex problems faced in their organisation. CCL suggests that learning agility is not a fixed disposition and can be encouraged through four key behavioural enablers (Innovating, Performing, Reflecting, Risking) and one behavioural derailer (Defending). Agile learners make sense in knowledge-based organisations because of increasing uncertainty and complexity in today’s work environments, such as in Kathy’s situation. In return, being an agile learner also encourages proactivity because it allows employees to anticipate situations. It increases their flexibility and expands their repertoire of strategies to choose from in facing complex issues. In CCL’s article titled Learning About Learning Agility some key developmental activities are suggested to develop this form of mindset. These are listed out in the table above. 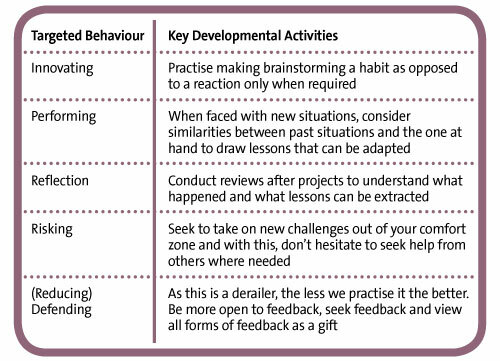 While not everyone will adopt these behaviours all at once, practising them allows us to become more agile learners with a mindset that fosters our own proactivity. Practising innovation reminds us to take different steps. Yet this is also balanced by the practice of reflecting on what lessons we can learn from each of our solutions. Execution-as-learning is an interesting concept put forth by researcher Amy C. Edmonson, whose research shows that instilling learning as part of the organisational process is a better execution style, especially for knowledge organisations. In this framework, leaders act as inspirational figures who articulate the mission. Tentative work processes are guidelines and continuous streams of information are provided to ensure employees are always equipped to problem solve. Edmonson suggests that in order for this framework to occur in an organisation, there needs to be psychological safety. What this means is that employees feel a sense of courage to take risks because there is no interpersonal risk of being ridiculed or fear of failure. She also focuses on a few key steps to build this framework focusing on organisational aspects of data and infrastructure for real-time collaboration. It is key to collect data especially when there are deviations from SOPs. This ensures that the guidelines are always updated to find the most suitable practices and reminds employees that they can make a difference. As for real-time collaboration, organisations like Group Danone organise “Knowledge Marketplaces” to ensure exchanges of best practices, which reduces the burden on leaders as the only source of data. The bonus? It also encourages employees to be resourceful. By having process guidelines derived from best practices accumulated through various sources (i.e. experts, competitors, previous experience), routine action is simplified and nuances are highlighted in each case. Having a trusted base of data for employees to make their decision, coupled with a psychologically safe environment becomes a good platform to encourage proactivity among employees as they are better able to decide and take the “where applicable”, “where necessary” risks. The concept of proactivity is something that needs to permeate the organisation at all levels including its individual employees, processes, policies and seen as continuous development. Going back to Kathy’s situation, just being an agile learner who practises innovating and risking will probably encourage her to go for answer C.
But add to that the influence of her organisation as one that encourages execution-as-learning, she is more likely to act on answer D because there is a strong base of real data guiding the SOPs that become input for her solution to the problem. The shift to an opportunity mindset is a combined goal of both the individual and organisation. How will you teach fishing today? Evelyn Teh is part of Leaderonomics’ talent acceleration team. For more information on our talent acceleration programmes, email people@leaderonomics.com. Click here to read more articles from Leaderonomers.